I recently read a quote from a travel writer that went something like “We will never travel anywhere again that we haven’t already seen.” They were referencing the fact that you can look up most every place online now and see satellite images or photos posted by everyone that has traveled there before you. It’s true. Before I travel I do quite a bit of research, partly because of the excitement and anticipation and partly because I don’t want to miss a thing when I visit a new place. Luckily all the photos and videos you consume can never replace the real thing…like on this vacation to the island of Providenciales in Turks & Caicos, I saw a place that had me thinking we were on a different planet…but I’ll get to that later. If you enjoy snorkeling, then any of the villas in this area are a must. Smith's Reef is a protected reef that is known for the best snorkeling on the island. We brought our snorkeling gear with us and when the mood struck us, we could wade into the water and explore up and down the beach. It is so easy to get to Turks & Caicos from Boston that we arrived in time for lunch! This also meant that we were there before it was time to check into our villa, so we dropped our bags at the villa and went to The Beach House for lunch. By the time the Rosé arrived at our table, we were officially in vacation mode. 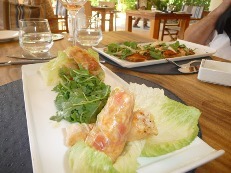 This is a relatively new restaurant located at the Beach House hotel not far from our villa. Teak tables are set up poolside under a covered area. The service was friendly and attentive and the food was a feast for the eyes and the taste buds. We dove right into the island specialty, conch. Here they make a conch salad wrapped in rice paper which was light and fresh. We also enjoyed their flatbread pizza with arugula, mushroom and truffle oil.